This week marks 15 years of ser­vice at UMFM for Sta­tion Man­ag­er Jared McK­e­ti­ak. While he’s held the lead role at the sta­tion for over a decade, he got his start vol­un­teer­ing as a board op for Win­nipeg radio leg­end Howard Mand­shein and oth­er great pro­grams in the ear­ly years of the sta­tion before mov­ing to the Pro­gram Direc­tor position. 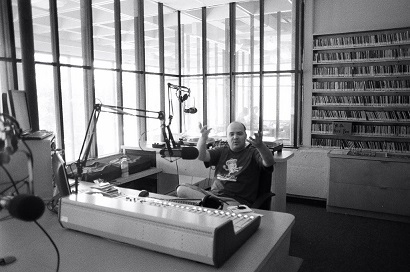 Dur­ing his decade and a half at UMFM, Jared has been involved at a lead­er­ship lev­el with the Win­nipeg Ska & Reg­gae Fes­ti­val, the Nation­al Campus/​Community Radio Asso­ci­a­tion and more recent­ly the Big Fun Fes­ti­val as well as a strong sup­port­er of many oth­er local music, cul­ture and issues fes­ti­vals and initiatives. He built the Pledge-O-Rama fund­ing dri­ve from the ground up and made it the annu­al suc­cess it has been, and has been a cham­pi­on for the local arts scene and a tire­less sup­port­er of the vol­un­teers who make the great pro­gram­ming at UMFM. Big con­grat­u­la­tions to Jared on his 15 years of ser­vice, and an even big­ger thank you from the rest of us at UMFM.